ACTION ALERT: Support An Excellent Judicial Nominee! We have a great opportunity to support a stellar judicial nominee to our federal court system. 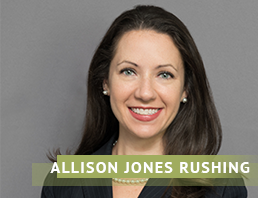 Allison Jones Rushing has been nominated by President Donald Trump to fill a vacant seat on the U.S. Circuit Court of Appeals for the Fourth Circuit. Rushing is a North Carolina native and a graduate of Wake Forest University and Duke University Law School. She has clerked for U.S. Supreme Court Justice Clarence Thomas and for Justice Neil Gorsuch when he was on the Tenth Circuit Court of Appeals. It is our understanding that both of North Carolina’s U.S. Senators, Richard Burr and Thom Tillis, support Rushing’s confirmation, but it would help to bolster their support if they were to hear from you TODAY. Help ensure that this highly qualified North Carolinian makes it on the Fourth Circuit! (2) Strongly encourage their colleagues on the Senate Judiciary Committee and in the full U.S. Senate to support Rushing’s confirmation.